The chrome mask takes its styling from our traditional blank white male mask and gives it a futuristic twist. 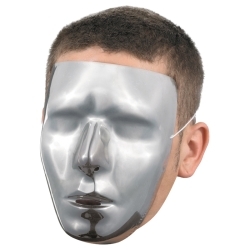 The mask features a chrome finish that works like a two way mirror allowing you to see out but preventing others from seeing in eliminating the need for holes for the eyes. The chrome mask is one size fits most using the attached elastic band.